The week-long Euro-Mediterranean Forum wrapped up on Sunday (August 31st) in Biougra, Morocco. The event brought together youth from across the region. The main aim of the meeting near Agadir was to develop methods of teaching citizenship and to promote cultural dialogue in European and Mediterranean nations, according to Abderrahim Bourkia, a Moroccan journalist and social science researcher. Mokhtar Nait El Cadi, the president of the Timzday Association, which organized the event, said it was an opportunity to take stock of the experience of different countries in terms of teaching citizenship. “The differences between Mediterranean nations require great capacity to manage the various aspects of cultural dialogue (e.g. political and religious). The forum is focusing on the management of cultural, religious and linguistic diversity in the Euro-Mediterranean region,” he underlined. He also said that the goal was to encourage young people to have a positive vision geared towards changing civic education syllabuses within the Euro-Mediterranean region. “We also need to take a fresh look at cultural dialogue programs and look at how we can make sure that the countries in the southern Mediterranean benefit from all efforts made to this end,” he said. Zeer Hatem of the Tunisian youth ministry explained the importance of the forum: “We start off by presenting the issues that must address young people’s expectations. Then we all reach agreement on a plan and work out the details of its implementation, and then its evaluation… This participatory approach enables young people to express their opinions and take decisions. Participation is the best way of assimilating the principles of citizenship,” he said. Meriem Narimen from Algeria, who is an assistant professor at the University of Batna, presented the changes in the concept of citizenship since the dawn of mankind. “The aim of my speech was to highlight the importance of teaching citizenship, a concept that can prevail over all other political, religious and ethnic affiliations in Arab countries,” she stated. 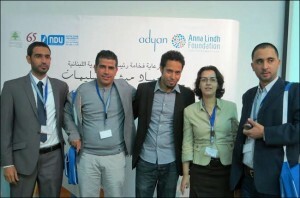 According to Abderrahim Bourkia, the Moroccan journalist and social science researcher, the conference sought to encourage discourse between cultures. In his view, the words “citizenship” and “dialogue” are two key terms to describe the main challenges facing European and Mediterranean countries, “especially after the recent major changes that have put many of them to the test”, he told Magharebia. This mechanism, he said, necessitated support for democratic and political transition by empowering citizens and young people to participate in public affairs. Civic education and multicultural dialogue would enable citizens to play their part in contributing to constructive change and development in their countries, Bourkia added.